I recognised the genius of Robbie Williams when he had a hit with “Feel” . The Arctic Monkeys began to mean something to me January this year. And last month I discovered Amy Winehouse. I heard the acoustic version of ”Valerie” in the train and was blown away. 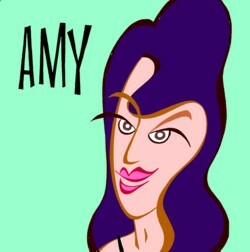 Of course, I had heard songs of Amy Winehouse before, but that never struck with me. Two nights ago I watched and listened to videos of Amy Winehouse on YouTube. Live versions, demo’s and outtakes. I skipped all the video’s where she is drunk or stoned or whatever. To see such a woman go to waste is too much. She could have been my daughter, and just the idea brings me to tears. But man, can the girl sing! I recorded some of the best songs that are not on her CD’s, and heave been listening to that compilation non-stop. Net de eerste video gezien: wat een talent!